Bill Collings has been making guitars in Texas since the mid-1970s, first on his kitchen table and by the mid-1980s in a small shop. Early on he attracted the attention of young local musicians like Lyle Lovett, whose own ascendency was achieved with a Collings guitar in hand, which helped bring wider recognition and a request from Gruhn Guitars in Nashville for a run of custom instruments in 1989. Today Collings is considered one of the premiere producers of fine fretted instruments. The company’s founder remains a hands-on luthier with a reputation for fastidious attention to detail beyond even what one might expect of a craftsman from a family of engineers, along with an adamant intolerance for anything less than the finest work and products possible. From the earliest examples, the name Collings was synonymous with exceptional quality. That reputation only increased in validity as the company grew in size, to some 50 employees, and the range of instruments produced spread to mandolins in 1999, electric guitars including solid bodies and semi-hallow archtops in 2006, and ukuleles in 2009. All of them have unique character with uniquely refined tone compared to all other brands. Inspired by the classic guitars made by Martin and Gibson in the 1930s and ’40s, Bill Collings developed his own special construction techniques that help his instruments stand apart from the rest of the modern guitarmaking herd. The hallmarks of Collings acoustic guitars can be summed up in the terms clarity, purity, power, and sustain. Some of that comes from the thin yet very hard lacquer finish, but a lot of it is due to the particular take on neck geometry and engineering. While Collings now offers two styles of traditional V necks in addition to their original design, all of their necks tend to be sleeker and with less wood than comparable guitars. 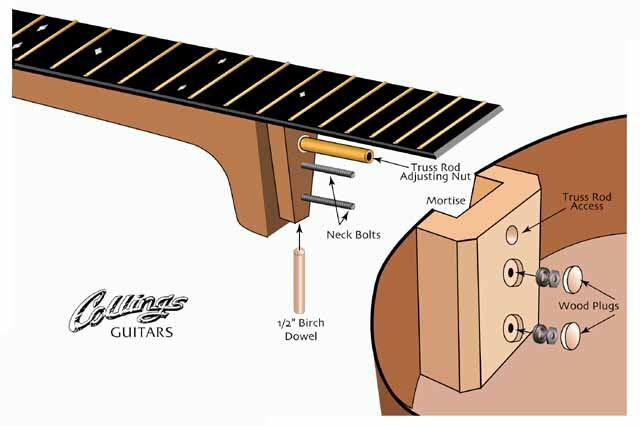 But they also house a piece of spring steel on either side of the adjustable truss rod, increasing the density and stability of the neck, which also employs a rather wide V-shape tenon, similar to a traditional dovetail, in combination with modern bolt-on technology that has two long bolts passing through the neck block, and a birch dowel placed up into the heel of the neck. Thus, Collings acoustic guitars have strong, dense fundamentals with chrome-plated vibrancy in the trebles and the clean, clear definition projecting from all six strings associated with bolt-on neck guitar designs, in combination with certain levels of a broader undertone resonance, fatter harmonics, and the violin-like purity in the fundamentals associated with traditional dovetail neck joints. Quite recently Bill Collings introduced a new brand name, Waterloo, which will be a line of guitars dedicated to resurrecting certain designs from the Depression Era, which were made for the general population who could not afford the top shelf brands. The first Waterloo models are the WL-14 and WX-14, which appear to emulate the Kalamazoo guitars that were similar to the Gibson L-00. The L version has ladder bracing, while the X version has X bracing. It is a brilliant idea to offer Collings quality in less-expensive instruments, which also aims to recreate a tier of guitars that found their way onto the backs and into the hands of many traveling troubadour bluesmen of the early and mid-twentieth century. Most of those guitars today are unplayable after 80 years of stress and strain on thin wood and necks that were often made of birch or similarly softer woods, usually without much in the way of support. Something tells me Bill Collings will be making his to last. One Man’s Guitar looks very forward to reviewing a Waterloo just as soon as we can get one in front of our cameras.